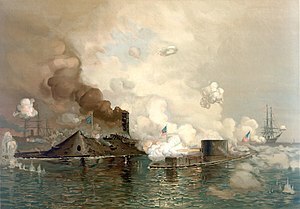 On this day in 1862, the Monitor and the Merrimack met at the Battle of Hampton Roads in history’s first duel between ironclad warships. The USS Merrimack was sunk by Union forces when the Civil War began in April 1861. At that time the Merrimack was a 40-gun wooden frigate. The Confederates raised the ship and rebuilt it, covering it with 4-inch iron armor. The ship was launched in February 1862 and rechristened the CSS Virginia. The Confederates quickly put the Virginia to work in their effort to break the Union blockade of Southern ports, which had been in effect since the beginning of the war. On March 8, 1862, the Virginia sunk two of the Union’s wooden ships and disabled another, proving that wooden ships had little chance against ironclad vessels. The Union, however, was ready to answer the Confederate challenge. One month previously it had commissioned its own ironclad, the USS Monitor. The Monitor had a much lower profile than the Merrimack (Virginia), rising only 18 inches from the water. Its flat iron deck featured a 20-foot cylindrical rotating turret with two 11-inch guns. On the morning of March 9, 1892, the Monitor steamed into Chesapeake Bay, confronting the Merrimack. The two ships battled for four hours, but since the cannon fire simply bounced off the armor of both ships, the battle ended in a draw. The dual ushered in a new era in naval warfare, and soon all the world’s naval warships were constructed with iron (1).